For Christmas my mom got Eva and my niece a 3 month Subscription to Green Kid Crafts. 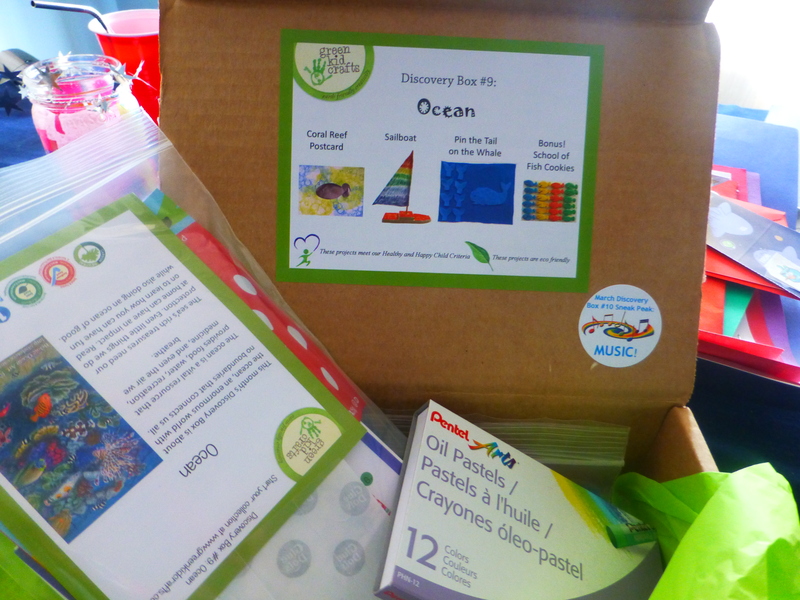 Green Kid Crafts is an amazing Eco-Friendly Company with monthly craft projects for kids. Each month a themed box arrives in the mail with materials to do 3 unique projects. All of the supplies for the crafts are made of recycled or other eco-friendly materials. The supplies are high quality, the crafts are super fun and for $19.95 a month (free shipping) it makes for a great gift! After one month, I was hooked and asked that they extend our subscription indefinitely and also add a sibling kit for an additional $10. Now Wally and Eva each have their own boxes and they have had so much fun with the different projects! Last month was all about Observing Nature and there were nature journals to create, a nature collection bag with a magnify glass and a bird feeder pinecone kit. This month was all about the Ocean and came with materials for fishy postcards, Pin the Tale on the Whale and a wooden sailboat to decorate. 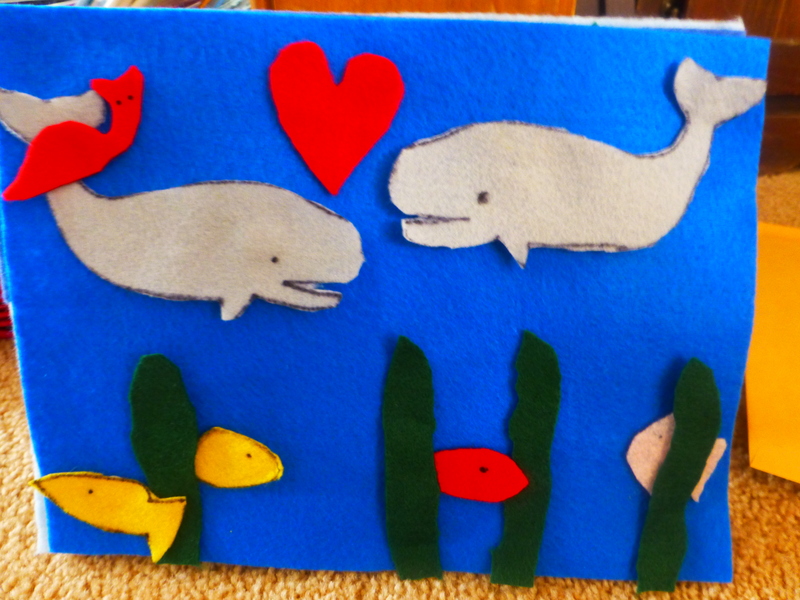 We decided to turn our Pin the Tail on the Whale into an Ocean Felt board modeled after the story, The Snail and the Whale. 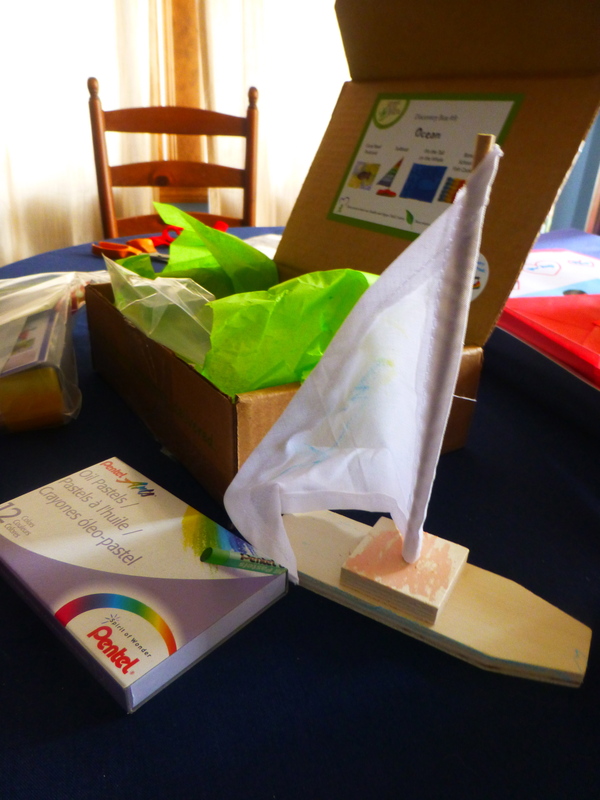 The kids have been playing all morning with their felt boards and their boats. The customer service is incredible and so personal. I also love the coupons that come in the kits for organic and eco friendly products. This company has an incredible product and I would highly recommend them to anyone. And this review is not being sponsored by ANYONE….I just want to spread the word about this great company and this unique gift opportunity for kids. If you act quick, you might be able to get your own Ocean Box or wait for next month which is a Music Theme. Happy Crafting!!! And who doesn’t love getting something in the mail! A “Happy Mistake”…I ordered the wrong one, but turns out to be very good! Glad they are enjoying it. Yes, a very good mistake!! !